Come and watch this special performance of Iwami Kagura, UMI KAGURA, on a quiet beautiful beach of Iwami! 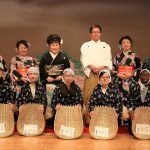 “Umi Kagura” is a performance of Shimane’s traditional performing art, Iwami Kagura. 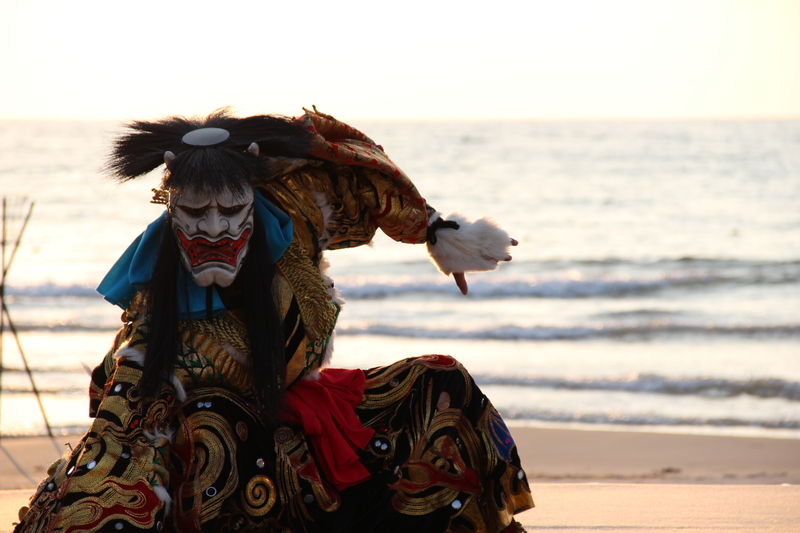 It is performed on a specially built stage on the beach with the setting sun in the background. 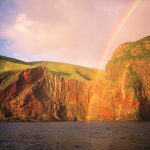 Watch the heroic stories unravel at this marvelous location! 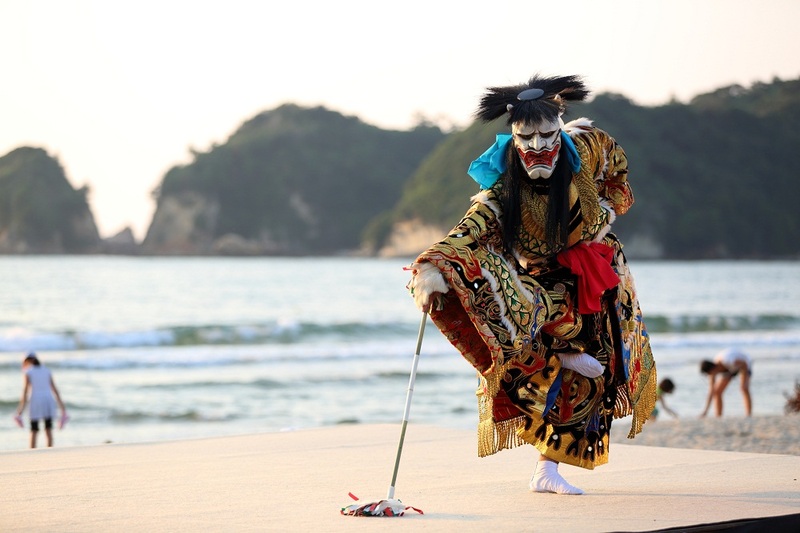 Iwami Kagura is a traditional performing art that has been passed down in the Iwami region of western Shimane. Originally it was dedicated to the patron god during the autumn festival every year to show gratitude for the year’s harvest, but slowly evolved into the hero of the Iwami people and the extravagant local performance they have now. 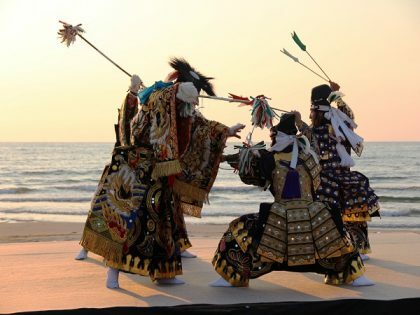 Luxurious costumes made from threads of gold and silver worn along with expressive masks attract people of all ages to the dynamic performances of Iwami Kagura. 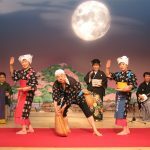 Iwami Kagura is not only performed within Japan, but there are also many performances overseas as well. 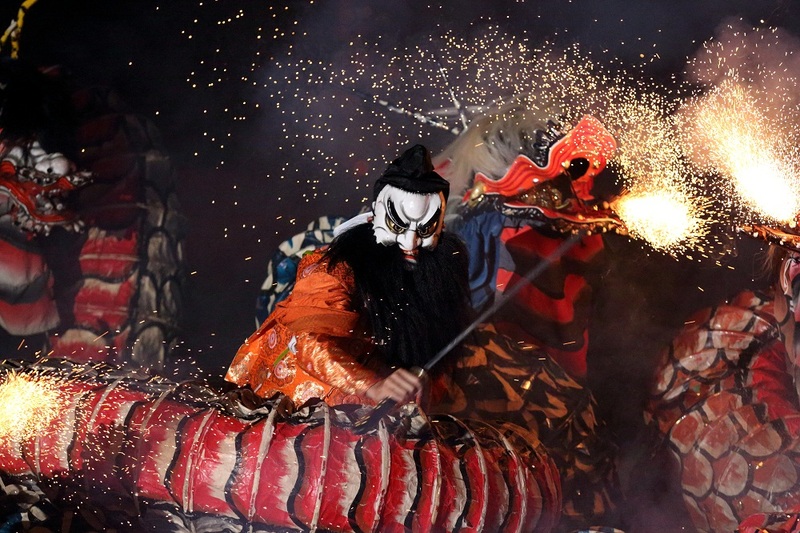 The Iwami Kagura performance of “Orochi” breathes fire and smoke with a classic ending of good prevailing over evil. 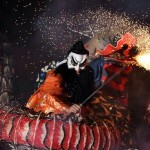 An easy to understand plot inviting people into the world of Japanese mythology. Tickets go on sale from 7/12. Seats are limited so get them while they are still available. 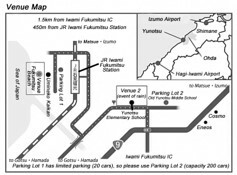 *express trains do not stop at JR Iwami Fukumitsu Station. -Pictures/videos will be taken for use at a later time, so please understand that there is a chance that you may appear in the recordings. 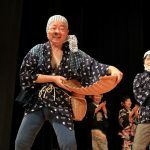 -In the event of rain, the performances will be moved indoors. Yunotsu Elementary School (map) Please check our Facebook page or the Ohda City Tourism Association website for information in the case of location changes or cancellations. -No refunds will be made except for the case in which the event is cancelled. Handling fees will be applied when refunding.